Awhile back, Sue was brave enough to show a picture of her garage. Since then I have been toying with the idea of showing you a picture of my garage. I'm kind of embarrassed as it's really awful. A giant mess, really. 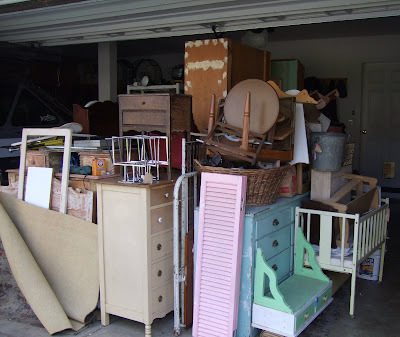 Tracey talks about her favorite part of junking here. She, like me, loves the find. That is my absolute most favorite part. Don't get me wrong, I do love transforming my finds into something lovely, but, finding the thing in the first place is what really gets me excited. Unlike Tracey however, I don't bring those special items home and get busy transforming them right away. I sure wish I could/would. So, all those special items that just need a little something extra end up here. This room used to be a lovely sitting room (was supposed to be the formal dining room, but we are definitely not formal people) and free from clutter. Somewhere along the way it became the dumping ground for the stuff I bring home and can't fit into the garage. Usually it's smalls on route to Monticello or upcoming shows, but as you can see, I have some bigger furniture in here as well. 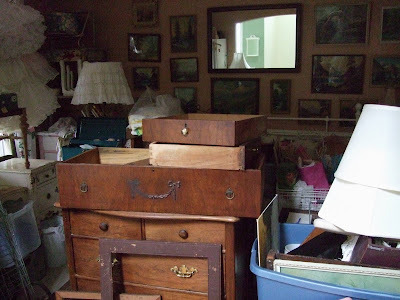 And, like the garage, there is some great stuff in here, but most of it just needs some TLC. My goal, and I have said this out loud to more than one person, is to make a better effort to find things that are ready to sell as is. The problem with that is my budget. Usually, those items cost more and I just don't have the funds to go to an estate sale and say, spend $500 on a bunch of furniture and other items that are ready to be tagged and taken to the mall. So, I look for the bargains and more often than not, they are usually things that need work. Repair, paint, fabric, sometimes all three. In a perfect world I would be more like Tracey and transform my finds before buying any more. But once again, the find is my favorite part. It's my therapy, my bliss. My husband really is a saint to put up with all my mess. He will even help fix stuff from time to time if I ask real nice. Also important to note, I do work well under pressure and since my next show isn't until June (Farm Chicks) I haven't been as motivated to work on stuff as I would be if I had a show sometime sooner. I always think I have so much time, but when it comes down to the wire, I usually get the stuff I want to get done, done. Of course, that's not to say that if I had been more organized and more motivated, I could have gotten a whole lot more done. That said, here are couple things I have transformed over the last week. 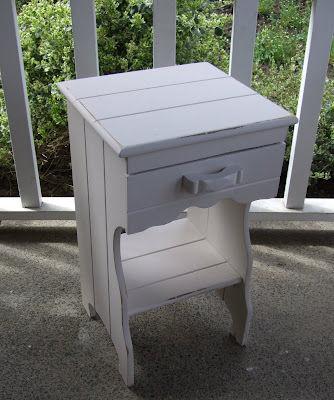 This is the little bed side table I showed in my last post. It got the creamy paint, shabby treatment and has already been taken to Monticello. 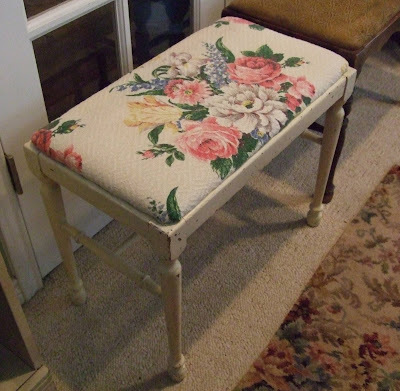 Recovered this little vanity bench. It already had the great creamy chippy paint that I love. I've had this little cabinet door for several years just hanging out in the garage. I think I bought it with the intention of making it into a sign. 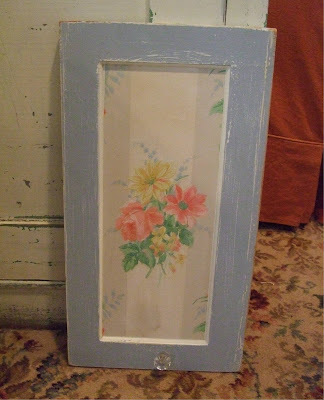 Dug out some of my vintage wallpaper, added a little glass knob and voila, instant cute. 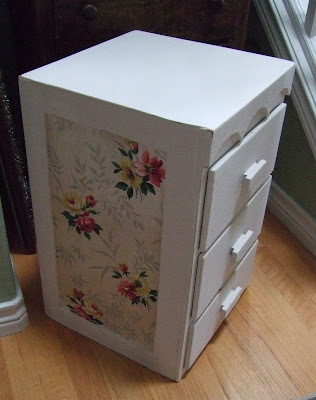 Another easy wallpaper project. 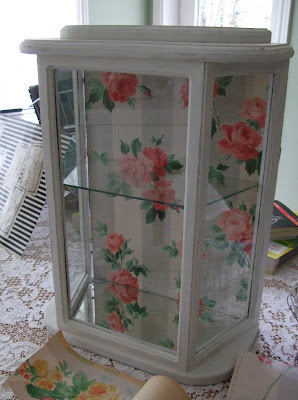 Got this adorable display cabinet from Diane. It already had the cute black and white stripe paper with vintage receipts that you can see in the background, I just thought the rose paper was more me. 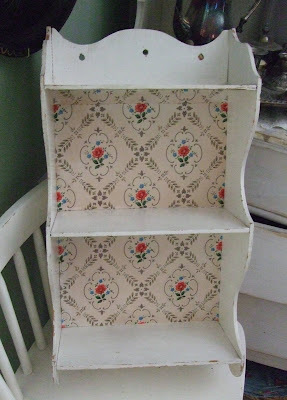 This little shelf I found at the auction and decided it needed to be prettier. It was already painted white so all I had to do was add the wallpaper. This cabinet came home from the last Expo with me. I gave the whole thing a fresh coat of white paint and added the wallpaper to the side panels. 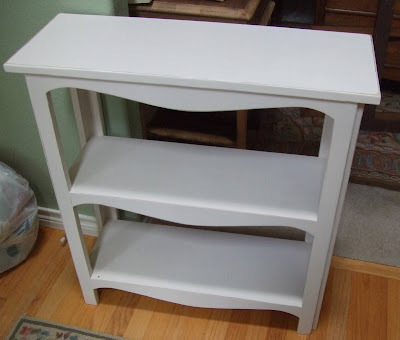 And finally, this little shelf was a find at the Value Village. It was brown and not too cute, so it got some white paint as well. Well, that's it for now. I have a couple posts in the works including one about another little road trip I took with my family last weekend. We here in the PNW are experiencing the most lovely spring weather. I couldn't be happier. I even rode my pink cruiser to Home Depot today. What fun! Hey Dear! I thought my garage was bad, but yours wins the prize. At least it is all in a tidy pile. You've been a busy gal with all those transformations - cute stuff! Hope to connect with you on Wednesday. I agree this weather is amazing! Yay! Someone with a garage and dining room that look like mine. Becoming a dealer three years ago means that I've started renting my daughter's garage as well. I'm with you, it's all about the hunt! If you're ever out in Colorado look me up. Hi, Lisa! Everything looks WONDERFUL to me! Kinda reminds me of Scrooge McDuck's vault ... so much treasure I just want to dive right in! Great job on your projects! Ok you made me feel much better about mine, but still I am on a mission to get mine cleaned up! oh wow, I love the wallpaper, I think my favourite is that little display cabinet. I hope you dont mind me asking but what do you fix the paper to the furniture with and do you seal it afterwards as well? Not sure we have the same products as you here in Australia but would be similar ones around! How creative you are! I loved the pictures showing your stock of interesting finds and furniture. Spotted lots of things I like. I quite like the idea of having such a room full of my latest finds! Nothing to be embarrased about, you have a fine looking garage in my opinion! It's like having a vintage/antique shop in your garage! Hey, at least you get it done! And, may I add, you have done a FABULOUS job on everything you showed us. I love it all! Your garage is neat compared to mine! Our 3 stall garage is filled to overflowing...I also love the hunt the most!! I own a small collectible gift shop and always need to ad new old things, but the projects don't always move along as quick as I like. I love what you do with wall paper, what a great idea. Enjoy working with all your neat stuff! I think your pile is wonderful and tidy compared to my big mess that is scattered from hither to yon. I would take a picture but, I don't have a wide angle lense!! Your projects are awesome! But it does seem to me that the projects multiply at a faster rate than I can keep up with!! Oh I just wrote a blog about the aquiring and I was tempted to put up a pic of an unusable part of my house next week. Now I definitely will! Pop over and see why not very much TV gets watched from our sectional ;) I will link to this when I do, great blog! Took my kids w/ me and picked up a free vintage, foldaway, ping-pong table. I'll use it for yard sales, when company comes for outside parties, and for playing ping-pong outside. It fits just fine in the shed . Your stuff -correction- cool finds fixed up- look great !! !